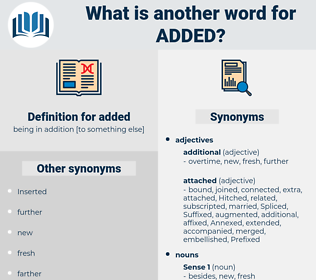 What is another word for added? widest, closer, adds, Adding, Aggregated, Addenda, Heightened, additional. corporations, attaches, clauses, rises, addition, additions, Adding, Aggregated, additional. additives, address, addressed, Indicating, Indicated, admitted, exacerbated, mainstreamed, modernization, complemented, advised, besides, contained, Participated, information, demonstrated, adopted, Acceded, developments, acknowledged, emphasise, emphasised, emphasize, emphasized, Testified, Introduced, Generated, accompanied, endeavour, reiterate, Reiterated, suggested, collaboration, declared, collaborate, Broadened, underscored, donated, described, also, represented, transposed, Created, reaffirm, reaffirmed, drew, details, illustrated, involved, revealed, Supplemented, arrangements, Delivered, deepen, deepened, Attracted, implemented, co-operation, cooperation, facilitated, Beside, acquired, allocated, dangerous, development, said, identified, identify, cooperate, Cooperated, Mentioned, inscribed, advice, asserted, recommended, alleged, progress, Explained, elevated, Wrote, disclosed, Provided, highlighted, initiated, recalled, Exceeded, Injected, Stipulated, apart, specified, specify, led, considered, Contended, valued, qualified, Measures, altered, Remarked, Followed, develop, developed, developing, elaborated, defined, accused, Totalled, Deemed, reported, beneficial, cancelled, established, Territories, estimated, Facilities, Widened, reminded, communicate, affirmed, produced, Regarded, Enabled, maintained, Agencies, relationship, determined, achievement, received, lent, Explored, clarified, clarify, clarifying, engaged, recorded, co-operate, Argued, endorsed, linkages, accepted, underline, underlined, expressed, Enshrined, proposed, joined, affected, affecting, pledged, Became, Boosted, invited, confirmed, behaviour, Signaled, announced, Brought, worsened, Achieved, institution, sent, support, supported, Carried, broadcast, Samarra, informed, stressed, common, Policies, fed, Clients, finished, la, road, Submitted, Digressed, published, mutually, mandates, original, Prosecuted, laid, functional, Deposited, Installed, spoke, imposed, Cited, noted, Promoting, within, Insisted, Benefited, Alia, welcomed, started, contacted, observed, Commented, uncovered, built, Had, raised, Told, Recruited, renewed, concerned, Praised, Issued, fostered, Allowed, pointed, intake, conduct, played, agreed, shared, Began, compounded, Gained, nourished, Amounted, placed, Discussed, outlined, outcome, work, works, Worked, Filed, precised, Claimed, Performed, Was, Were, Warned, spirit, Resulted, assured, Launched, found, Climbed, Supplied, opened, called, Grew, imbued, clause, Himself, felt, abuse, changed, changes, Came, organs, Believed, objective, Gave, Opined, any, proceed, items, piled, hired, released, questions, Replied, Offered, tabled, Quoted, healthy, Urged, Caused, stated, states, Asked, dropped, Helped, pursued, security, voiced, water, paid, heard, useful, covered, Referred, space, @, marked, effect, liaison, goal, Hiked, Took, action, paragraph, Summed, Accounted, set, same, permitted, Surged, peace, solved, solving, settled, next, opposed, fell, linked, respect, respected, Reached, Wished, service, services, egypt, severed, articles, showed, safety, founded, planned, resolved, resolving, Levied, crisis, Served, genuine, Remitted, body, Bodies, signed, hosted, opinion, item, functions, talks, Talked, Did, Hoped, posted, role, one, party, text, priced, thought, saw, 2004, formed, six, unity, Went, powers, views, 2006, let, unit, news, me, Numbered, based, 532, made, cut, 1991, Got, She, Inserted, clauses, Aggregated, Addenda, Heightened, additional. Indicated, adapted, admitted, exacerbated, mainstreamed, complements, complemented, Appended, contained, Accentuated, updated, Participated, accumulated, Attributed, demonstrated, advanced, become, adopted, complicated, aggravated, Acceded, emphasised, emphasized, Introduced, Generated, accompanied, dedicated, discarded, suggested, declared, designated, Broadened, loaded, underscored, Caught, escalated, replaced, donated, described, Rendered, Excluded, drawn, establishment, detailed, multiplied, constituted, assigned, transposed, Created, Undertaken, Translated, Assimilated, involved, Supplemented, Delivered, deepened, criminalized, implemented, repeated, cooperation, facilitated, acquired, allocated, said, identified, Cooperated, complimented, Mentioned, inscribed, Capitalized, read, written, alleged, Amplified, reduced, reflected, Deployed, Explained, calculated, embodied, Embraced, embed, left, anticipated, Provided, highlighted, initiated, Equated, Replenished, Exceeded, implicated, Injected, spent, enclosed, Transferred, absorbed, specified, led, leveraged, considered, valued, derived, tightened, Cumulated, altered, Followed, developed, elaborated, finalized, defined, Constructed, Communicated, required, Totalled, authorized, reported, established, Purchased, filled, redacted, Widened, deducted, produced, devoted, Regarded, Enabled, maintained, prepared, connected, determined, Challenged, arranged, Earmarked, received, lent, entrenched, stockpiled, finalised, clarified, engaged, furnished, authorised, recorded, Argued, endorsed, accepted, expressed, Enshrined, proposed, Disbursed, Compared, joined, fortified, affected, composed, selected, prescribed, withheld, needed, perceived, conjugated, retained, Boosted, merged, confirmed, approved, recognized, packaged, restored, Captured, Brought, worsened, documented, Commingled, Enacted, organized, supported, Carried, directed, Managed, informed, stressed, fed, assisted, charged, finished, formulated, Instituted, affixed, financed, Submitted, appointed, destined, Repealed, disposed, published, coupled, refined, Arrived, processed, Enriched, Computed, Dealt, Awarded, laid, Installed, chosen, elongated, imposed, Cited, noted, entitled, worn, Alia, scheduled, Passed, welcomed, mixed, conferred, suspended, located, started, have, Has, expected, dumped, organised, contacted, inputs, Lodged, Yielded, observed, built, foreseen, committed, conducted, Had, raised, Told, Recruited, renewed, concerned, credited, Issued, Allowed, pointed, warranted, Begun, Nurtured, moved, projected, played, designed, agreed, Emerged, decided, enforced, tempered, treated, compounded, nova, Gained, stuck, applied, unchanged, placed, remembered, Been, outlined, granted, Worked, Filed, Claimed, intended, Performed, Stepped, Arisen, Resulted, assured, Launched, fulfilled, held, found, website, grown, Supplied, stopped, list, come, thrown, opened, presented, given, Questioned, called, changed, Aimed, hired, Fitted, released, equipped, printed, Offered, tabled, Quoted, Escorted, Meant, Caused, stated, Asked, used, conference, Helped, voiced, paid, positioned, taken, groups, covered, aligned, Referred, marked, Bundled, Hiked, stored, ., staffed, united, backed, set, serviced, fuelled, permitted, settled, requested, linked, Reached, studied, founded, planned, known, risen, fixed, Served, Remitted, focused, signed, bolted, done, funded, sought, vested, site, posted, party, text, seen, kept, Returned, inclined, formed, pinned, C, me, Numbered, made, shed, Got, named, Inserted, Aggregated, Heightened, additional. But there is one to be added.
" Some among them are still best - sellers," added Athalie. adh, auto, awaited, awed, ahead, adit, aided, add to, audit, aid, ad, adieu, ate, adhd, aoudad, a.d., attitude, ado, aythya, aide, aditya, ao dai, athodyd, aditi, at, adad, ada, ahuehuete, ade, await, audio, audad.